These are lyrics by New Kids on the Block that we think are kind of repetitive. 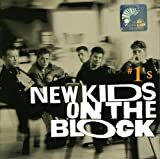 New Kids on the Block's, "Step by Step (remix)"
They literally resample 'step' 88 friggin times, 4 times a bar for 22 bars at the beginning of the song. New Kids On The Block's, "You've Got It (The Right Stuff)"
Get it out, get it out, get it out.